Near the beginning of World War One, and within weeks of the war ending, there were mentions in the press of improvements to St James Park. At a Supporters’ Club meeting in April 1914, members discussed a proposal to build a covering on the popular side of the ground; while in December 1914, the club’s annual report referred to the fact that the ‘new’ end had been ‘banked and stepped’. In May 1919, a ‘huge new stand’ was being considered. For the duration of the war, however, priorities lay elsewhere. Soon after the outbreak of hostilities, St James Park was placed at the disposal of the local military authorities. Troops were drilled there every day. Two pre-season practice matches, Stripes versus Colours, raised money for the Relief Fund. But how would Exeter City contribute to the war effort once it had been decided that Southern League matches were to resume? For the visit to the Park of West Ham United on Saturday 5th September 1914, recruitment advertisements were displayed. A recruiting sergeant was present, and after the game there was a public meeting from the grandstand aimed at encouraging those who had not already done so to enlist. There were similar scenes up and down the country at grounds where professional football was played. Although there was outrage that clubs were continuing their activities, continue they did until April 1915. Another example of recruitment at St James Park was during the game against Southampton on 19th December 1914. A Lieutenant Dunn of the Sportsmen’s Battalion was present. During the interval, the Western Times reported, ‘he crossed the ground from the stand side to the popular part, and delivered a stirring recruiting speech to a crowd of about 1,500.’ Of those, one third, it was calculated, were wearing khaki. Around this time, one City pro, Arthur Evans, joined the Sportsmen’s, another, Fred Goodwin, would enlist in the Footballers’ Battalion. The last Southern League game at the Park until the end of the war was on 17th April 1915, with Reading the visitors. Not long afterwards, with City ceasing to play matches, St James Park was loaned to the Athletes Volunteer Force. The rooms underneath the grandstand became the headquarters of the regiment. As well as drilling, there was instruction in rifle shooting. City were still tenants, but the rent, because of the altered circumstances, was reduced to a nominal amount by the Lady Anne Clifford’s Charity Trustees. Despite the change of purpose, St James Park continued to be used for sport. In October 1915 a ‘City of Exeter’ XI took on the Combined Batteries RFA from Topsham Barracks. Wounded soldiers from Exeter hospitals were among the crowd. The beneficiaries were the Mayoress’s Hospitality Fund and the Equipment Fund of the Volunteer Training Corps. For the latter, proceeds went towards the purchasing of stretchers and accessories for the ambulance section. The two funds benefitted again in December when an Exeter City XI faced the Batteries at the Park. A crowd of 1,200 attended, despite the ‘unfavourable’ weather. On this occasion, players included men home on leave from the Front. One of these was ex-City amateur centre forward Fred Bailey, an RAMC private. Six months later, Bailey was killed on the Somme. These military charity matches continued throughout the war. Not only were they fundraisers, they were seen by local army officers ‘as a valuable means for promoting physical fitness and esprit de corps’. In December 1917, at the club’s annual meeting, it was reported that work had recently been done to the ground. The fact that the pitch had been ‘put in thorough playing order again’ meant that it would be ready for when the Southern League started up again. But that would be almost two years later. As soon as Arthur Chadwick was reappointed manager, in February 1919, preparations began at St James Park for the next Southern League season. Chadwick spoke of the need for ‘test matches’ at the Park, in which talented local youngsters would be showcased. In May, suggested improvements to the ground were outlined in the press. 3rd September 1919: the first Southern League game at the Park since the end of the war. City’s opponents that day were Reading, the last team to visit, in April 1915. Three months later, on 22nd November 1919, before the game against Northampton, the Supporters’ Club organised a collection for a City player who had lost a leg in the conflict, Billy Smith. As Chadwick had remarked to the Express & Echo in February 1919: ‘Exeter, you know, has fared badly with its players in the war.’ Of the first teamers retained in 1915, he referred to the injuries to Smith and Fred Marshall, and to Arthur Evans being killed. Besides Evans, among players with City connections who had fought, there were twelve other known fatalities. 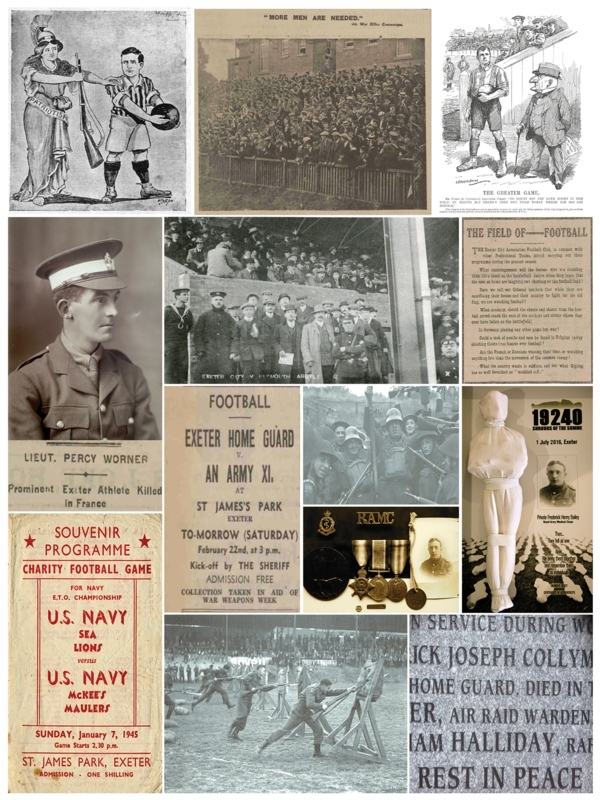 On 11th November 2014, a plaque was unveiled at St James Park: ‘In remembrance of those Exeter City FC players who died during World War 1.’ Players, staff and supporters were present at this commemoration. The fact that current players were in attendance gave poignancy to the occasion. In contrast to World War One, when war broke out in September 1939, League football promptly stopped. The FA, in consultation with the Home Office, were to allow friendly and competition matches on a regional basis. So a south-west section was formed, and this included Plymouth Argyle and Torquay United, but not Exeter City. Local military authorities had requisitioned St James Park. The last City side to turn out at the Park had been the Reserves, on Saturday 2nd September, for a Southern League game against Hereford. Soccer followers had six weeks to wait for the next fixture, leading amateur side Friernhay taking on an Army XI. No gate was taken. One week later, the East Devon Cup final scheduled for the Park was postponed. For the Express & Echo’s “Nomad”, it was ‘unfortunate’ that ‘the natural home of Association Football in Exeter for upwards of 30 years should be closed’. The next time St James Park hosted competitive matches was in May 1940. Permission was given by the Commanding Officer of the Devon Regiment’s Infantry Training Centre. Sidmouth and Old Haywardians (Crediton) contested the “Football Express” Cup final, and there was the final of the East Devon Senior Cup between St Mark’s and Southern Railway. As for City, despite the fact they had opted out of wartime football, ‘close contact’ was being kept with 25 retained players and assistance with equipment given to local amateur clubs. After a period in which the ground was ‘closed to the football public’, charity matches were arranged in early 1941. Beneficiaries were the Red Cross Fund and War Weapons Week. For the latter, in February, the Exeter Home Guard took on An Army XI: kick off by the sheriff, admission free and a collection taken. Capt. Hunter was commander of the local Home Guard. Later in the year, on Saturday 4th October, 4,000 assembled in the grandstand and on the terraces. On this occasion, a ‘demonstration’ by the Home Guard. On the pitch, besides displays by a bayonet squad and hand grenade throwers, there were performances by machine gunners, companies of route marchers and drill teams. Just over six months later and the Park’s surrounding area and the look of the city would be radically changed. During the Exeter blitz, in May 1942, St James’s Church received a hit. As the Devon & Exeter Gazette reported: ‘Struck by incendiaries, the roof quickly collapsed under the fierce heat.’ The blaze was fought by members of the Home Guard who were based in the adjoining school. According to the rector, the Rev Frank Lowman, ‘it was practically all over in half an hour.’ Among the victims of the raid were those with links to St James Park: City Chairman Lt-Col. (formerly Capt.) Hunter, and former player Albert Potter, an ARP warden. Thereafter, St James Park remained a venue for charity events such as the boxing meeting in August 1942 to raise money for sending parcels to Exeter prisoners of war and for the Royal Devon and Exeter Hospital. In January 1945, there was even an American Football game between two US Navy teams, in aid of the British Merchant Navy Comforts Fund. The number of matches at the Park increased – City friendlies and games involving Service sides – and there was one organised by Exeter railway workers for the Red Cross. Wounded and repatriated war prisoners were guests at games. "The big bank behind the far goal has been terraced in concrete to bring about the best improvement that has taken place for the spectators’ comfort in my experience. The restepping of the covered-in popular side is nearly finished at the time of writing, and the amount of work done is almost incredible having regard to the derelict look the ground wore a twelve-month ago. Tidy terraces have replaced overgrown slopes, which might have been a section of jungle country. Guns, ammunition dumps and other legacies of wartime occupation have been removed. The playing pitch, used as a drill ground for the troops early in the war, and then as a park for heavy military vehicles until more sensible counsels put an end to that, is in surprisingly good trim. Perfect, no, but a lot better than could have been expected, having regard to the rough usage to which it was subjected over the war years. There is a neatness about St James’s Park which has transformed this compact ground into one of the best in the Southern Section. Definitely the ground is first-class."